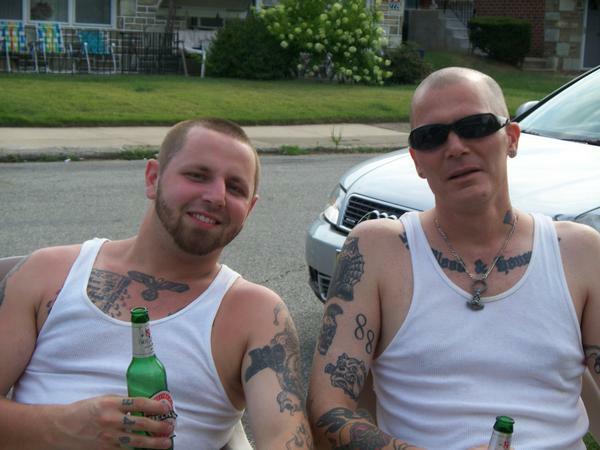 Keystone State “Skinheads” associate Joe Phy, left, with Phillips. This picture was taken before the assault. On the night of May 6-(Sunday), 2012, Masten and fellow white supremacist Frank Casiano broke into Phillips' house on Shisler Street in the Northeast, and they both beat and threatened to kill him Mr. David Phillips. Frank Casiano then pinned down Phillips, (unable to move or break himself free), while Masten gouged out his eyes. Mr. Stephen Lee Masten will now embrace life 83-years in prison for gouging out Mr. Phillips' eyes out of his skull, because Mr. Masten heard, (from his girl-friend, and wife at this time), that his wife was being sexually harassed and nearly molested by Mr. Phillips while he was in jail for shop-lifting; theft from a store.. The Philadelphia Common Pleas Court Judge Timika Lane in video above. The Philadelphia Common Pleas Court Judge Timika Lane called the 33-year-old Masten a "threat to society who is extremely volatile, and aggressive" before sentencing Mr. Stephen Lee Masten to 41 years and ½ years to 83 years in prison for the 2012 lethal assault on Mr. David Phillips and for assaulting an ethnic black prison guard. Judge Timika Lane noted Masten's history of moderate to severe mental illness throughout his childhood and how he was schooled in racism as a young boy child by his genetic father who took him into public residential mixed ethnic black communities "to assault various people of mixed ethnic color." [Judge Timika Lane]: "What troubles me Stphen is that you spoke a lot about yourself continuously, but you did not ounce during your entire dialog apologize for your criminal actions leaving your Aryan brother David Phillips crippled and mortally blind for life," Judge Lane said. "That says a lot about who you are Mr. Stephen Lee Masten and what you have present to my court about yourself to all these witnesses around you standing in judgement, besides myself." 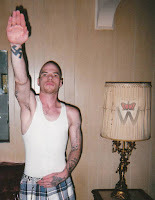 Mr. Stephen Lee Masten, is a short 5’ 9”, stocky muscular nearing middle aged looking man whose body is heavily marked with supremacist white-racist tattoos. Stephen said that what happened was a byproduct of life in a violent and drug-saturated by his fathers friends and hate groups. 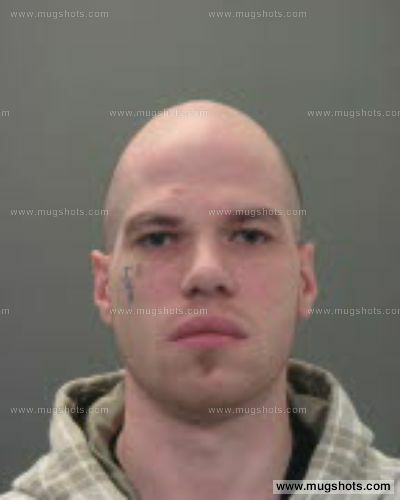 Mr Stephen Lee Masten Jr., when out on the town and been approached by ethnic blacks harassing them of their tattoos and a fight erupted, and Mr. Masten Jr., mentions he got the best of his attacker. We can only speculate what that means and we can only pray no one was killed. "I'm still a human being," Mr. Masten said. "We, (Stephan Masten and Frank Casiano), were both involved in these criminal violent actions and things we shouldn't have been involved in." "Every day Dave Phillips thinks about being blinded is a day I have to think about what I did," Mr. Masten said. "I don't expect Dave to forgive me." Mr. David Phillips, 47 years old, tall, thin, and equally tattooed, made it clear that forgiveness was not possible for him as an Aryan. "Whatever happens to Mr. Stephen Lee Masten, he will be able to see," Phillips told Lane. "He gave me a life sentence." 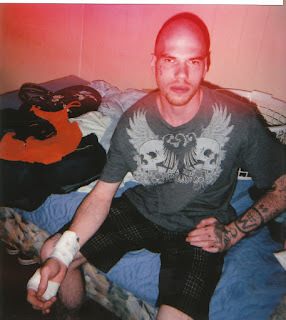 Mr. Stephen Lee Masten watched Mr. Phillips as his victim said, "I never did anything to you. How can a human being do something like this? You're not human." This photo was take of Stephen Lee Masten when he was arrested/booked in Bucks County, PA for RETAIL THEFT-TAKE MDSE. Authorities said there had been bad blood between Phillips and Masten about a purported incident involving Phillips and Masten's girlfriend when Masten was in jail. On the night of May 6-(Sunday), 2012, Stephen Masten and fellow white supremacist Frank Casiano broke into Phillips' house on Shisler Street in Northeast Philadelphia, and beaten and threatened to kill him. Casiano then pinned down Phillips while Masten gouged out his eyes. Casiano, 32, pleaded guilty last April to aggravated assault, conspiracy, and burglary, and is serving 20 to 40 years. Defense lawyer Andrew G. Gay Jr. argued for a sentence that gives Masten a hope of living outside prison. Gay presented the Rev. Matthew Palkowski, a Catholic chaplain in the city prisons, who testified that since his arrest, Masten has befriended an African American inmate and helped an Ethiopian inmate who had trouble understanding English. Palkowski said Masten has "taken a first step on the road to conversion and rehabilitation." Assistant District Attorney Erica Rebstock argued that Masten's 17 citations for prison misconduct since his arrest showed that he was not rehabilitated. An additional incident to which Masten pleaded guilty Monday was a Nov. 30, 2012, assault on a prison correctional officer. Rebstock said Masten yelled racist comments and spat at an officer in "an attempt to infect him with hepatitis." Five weeks ago, Rebstock continued, Masten was cited after a homemade 81/2-inch weapon was found in his cell. "He is not amenable to rehabilitation," Rebstock told the judge. "If he ever gets out, he will hurt, maim, or kill another person in Philadelphia."